Shepparton Villages is joining with GV Health and Greater Shepparton City Council to run the 2016 Corporate Pedometer Challenge in October and November this year. Participants - in teams of 4 to 6, or individuals – sign up online, and choose a charity to donate part of their entry fee to. The $20 entry fee (per individual) gives the participant a pedometer to track their steps, access to the website to update their weekly totals and a chance to donate to charity. Shepp Villages will be using any donation towards the new Hakea development, GV Health is using their funds towards the Beds Program, and City of Greater Shepparton has nominated the Community Fund as the recipient of their donations. The Pedometer Challenge is a fun way to increase fitness as we head in to some warmer weather. “It all started as a project to help keep our workforce fit and healthy. Our staff and their health are extremely important to us all as employers, and this is a very easy way to get everyone moving and focussed on their health,” Shepparton Villages CEO Kerri Rivett said. Registrations open on Monday August 15 at getmoovingshepparton.com.au/challenge and close on Friday August 26. Each of the three organising employers have committed to running events over the course of the challenge to provide extra opportunities to get step counts up. Details will be released closer to the Challenge start date. The challenge kicks off on October 10 and runs until November 7, but registrations for the event are open now and close on August 26. It is important to get your team registered now so orders can be placed for the pedometers that will be distributed at Aquamoves once registrations are closed off. 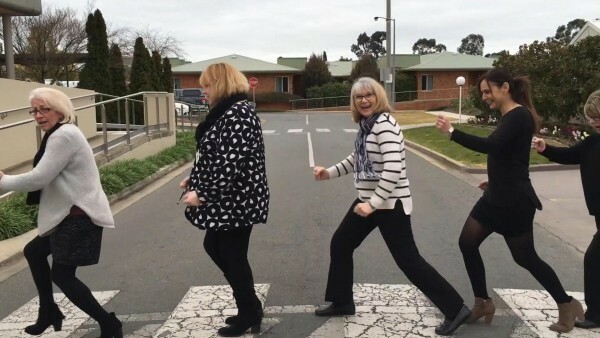 Staff at Shepparton Village are already getting their teams together and had fun making a small video clip for our Facebook page and website to kick things off!